I got up at 730 this morning and checked out the trash in Park Ex and Villeray. I went back to the place where I found the good stuff on Tuesday in the hopes that there would be more. Alas, no luck today. Still, I did some sorting of the treasures I did find and took some pictures to show you guys. 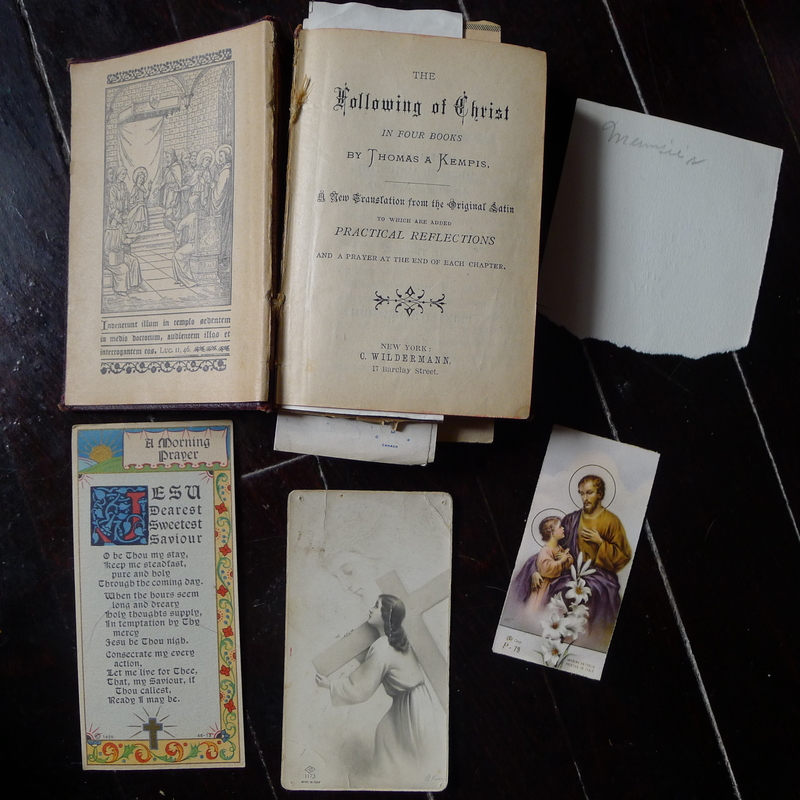 This post will focus mostly on ephemera, or old paper collectibles. I’ll start though with this cross. I thought the material of the cross looked special and decided to do the hot water bakelite test. It passed that test, giving off that specific formaldehyde smell. Unfortunately though I forgot it for a bit and left it in the water too long, which sort of damaged the submerged area (the bottom). It still looks good but not as perfect and shiny as before, though apparently there are things you can do to polish or buff bakelite. These, in good condition sell for around 30-50$. 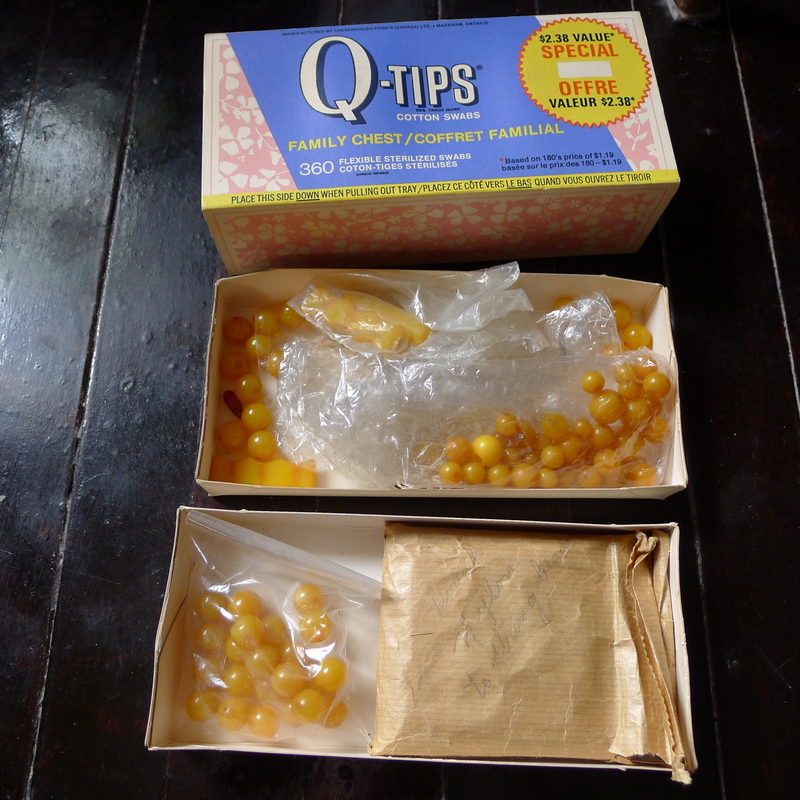 These beads, which were stored in this old Q-Tips container, also passed the hot water test for bakelite. They also come with some string for making necklaces. Most of them are different sizes of round but there’s a few odd long ones as well. Maybe I can make some necklaces! 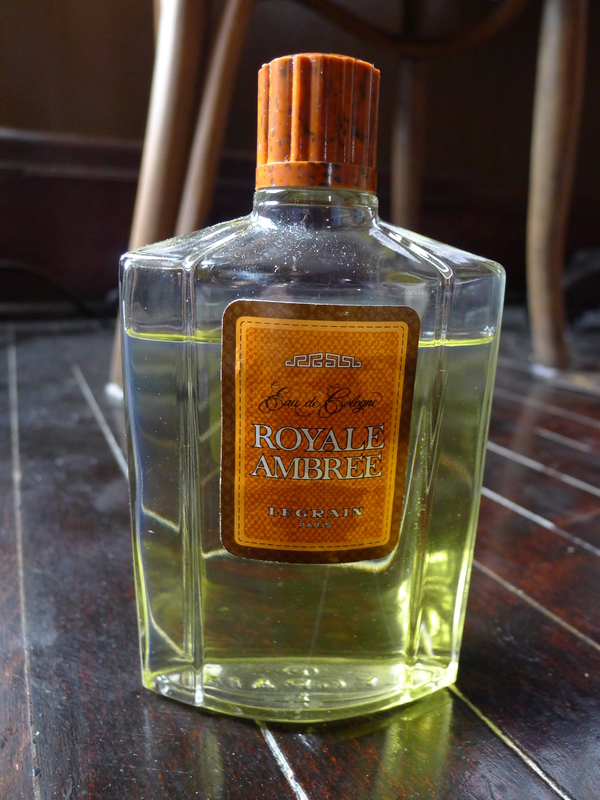 I found this bottle of Legrain “Royale Ambree” Eau de Cologne. It looks fairly old and the brand seems to be kind of collectible, there’s one similar (but not quite as old looking) up on Ebay for 50$. Here’s some of the ephemera. I thought these old business cards were all quite beautiful. The top three look to be from the early 1900s (the second from the top is marked 1911) while the bottom one is probably later, perhaps the 1950s. I have a little collection of old business cards I’ll likely add these to. 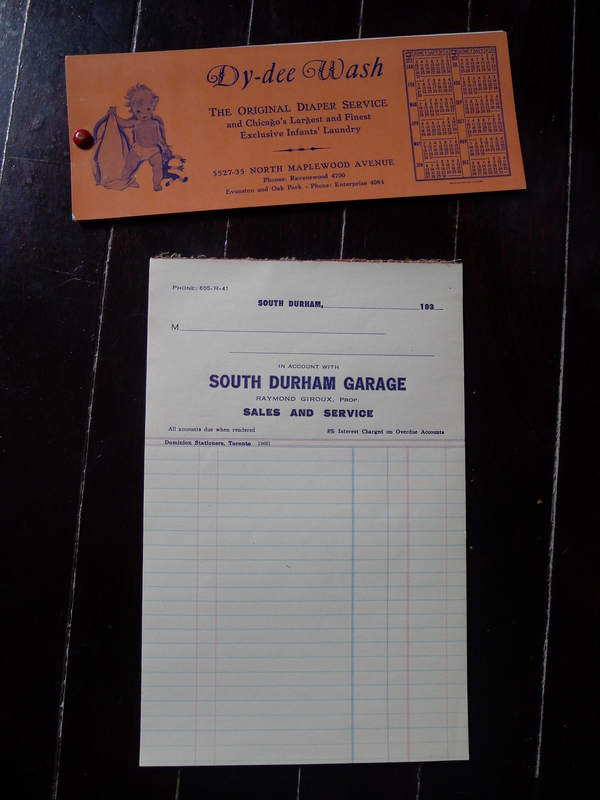 A notepad from a 1930s Toronto-based garage and a promotional notepad for Dy-dee Wash, the “original diaper service” in Chicago. It was made in 1943. Another one of “Mumsie’s” religious books. I couldn’t find a date but it’s probably from the late 1800s. 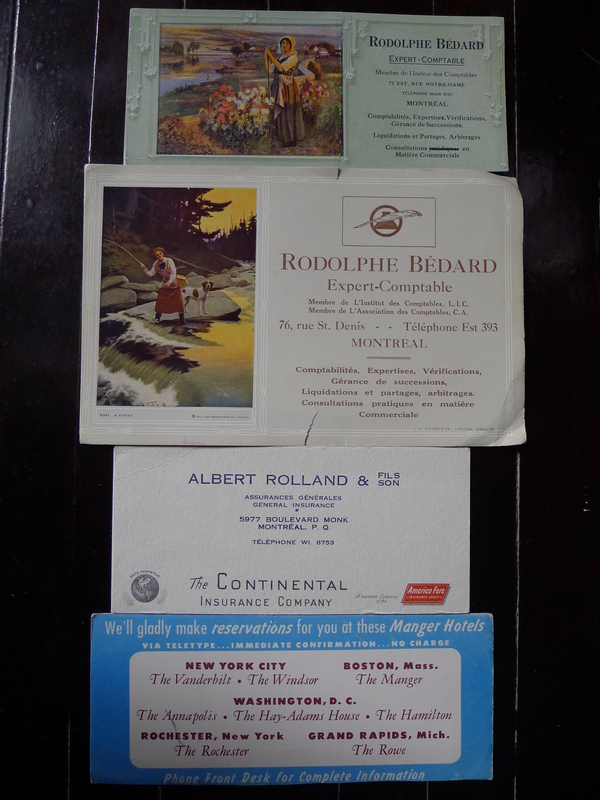 Inside are lots of little bookmarks, many of which are these great old lithographs. 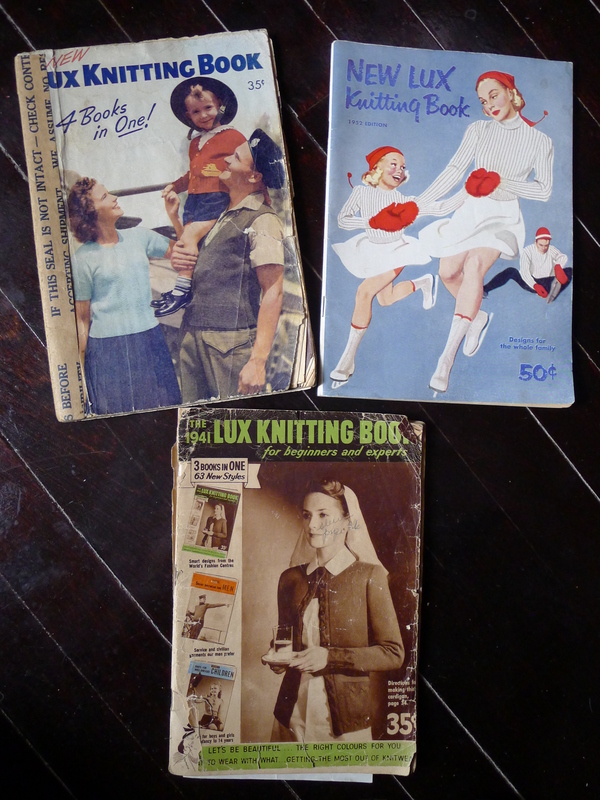 Old knitting magazines from the 1940s and 1950s. The older ones talk a lot of knitting in wartime. 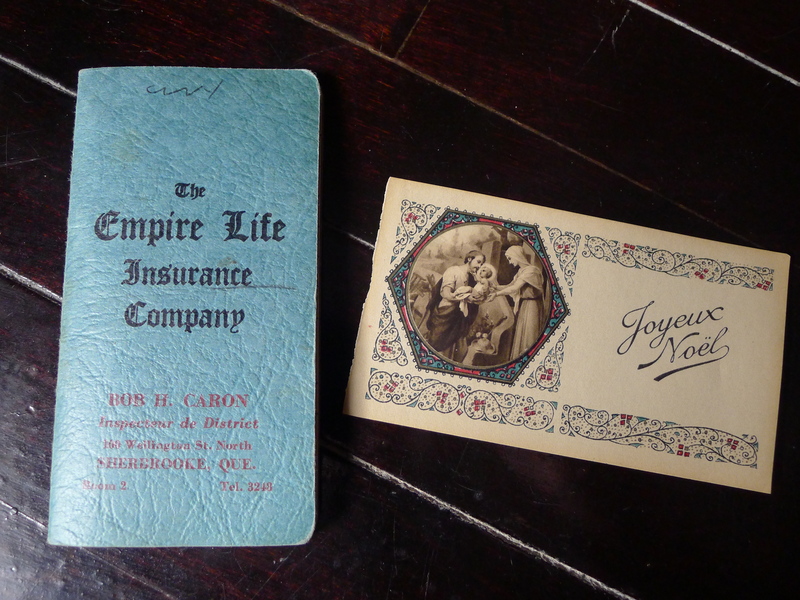 A nice 1940s unused notepad from an insurance company and another old lithograph (Merry Christmas!). 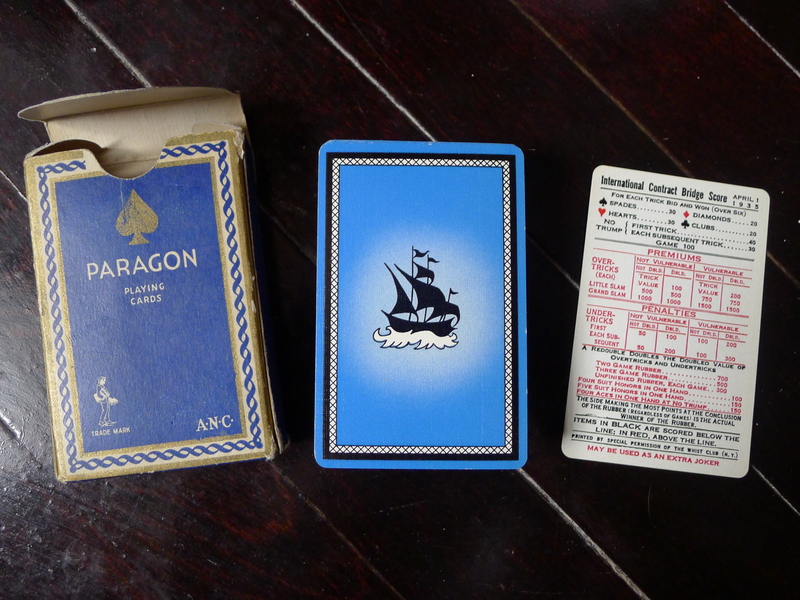 These playing cards are in excellent shape. I’m not sure exactly how old they are, but the “rules” section has the date 1935 printed on it. That might have just been when the rules were determined, however. I’ll finish of with a few of my favourite old photos. On the back is written “Rosie Carroll, Mum’s 1st cousin who sent us boxes and boxes of clothes from New York till we were grown up. 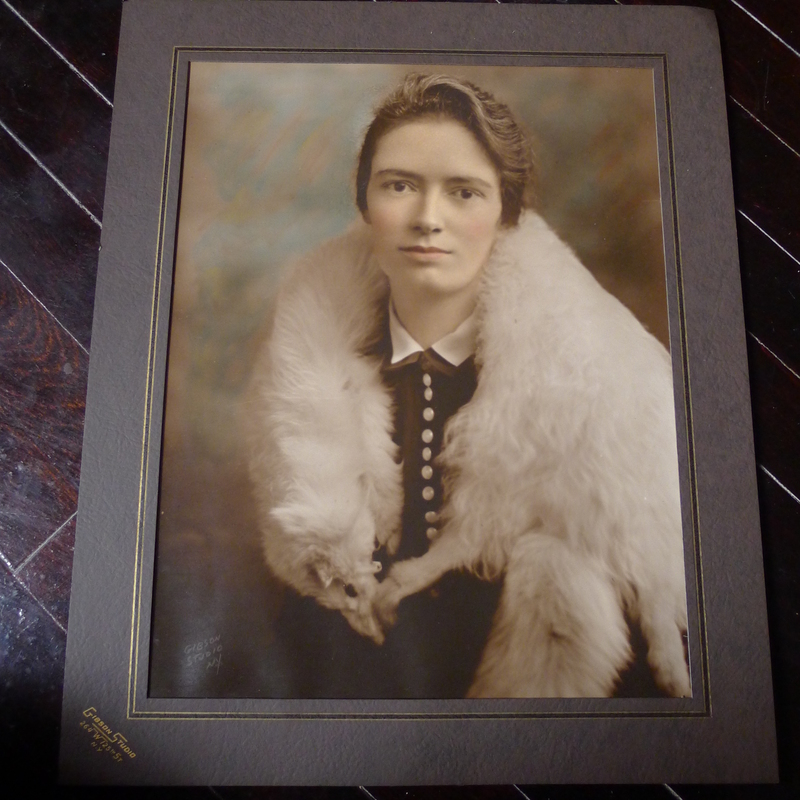 Thank you Rosie.” The picture, which measures around a foot and a half by a foot, was produced by a Gibson’s Studio in New York. This one’s captioned “The Captain, George Scott.” It’s a nice, if vaguely blurry colorized image. 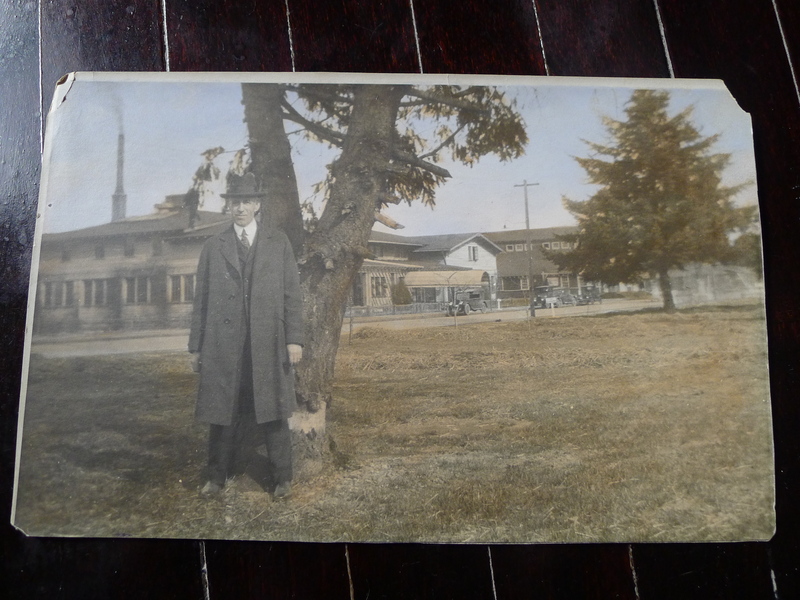 Judging by the old cars in the background it was probably taken in the 1910s or 1920s. This tin-type came out of an envelope that was otherwise full of funeral notices. I hadn’t noticed it before and was pretty happy to come across it! I love old tin types. 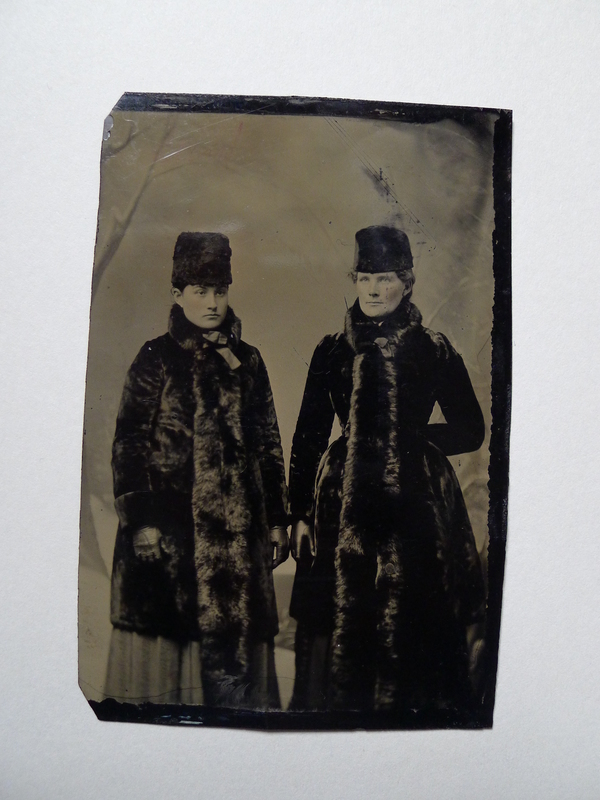 These women seem to be dressed completely in fur. There’s some writing on the back but I can’t make it out. I might be able to read it if I take a photo and do some editing, however. 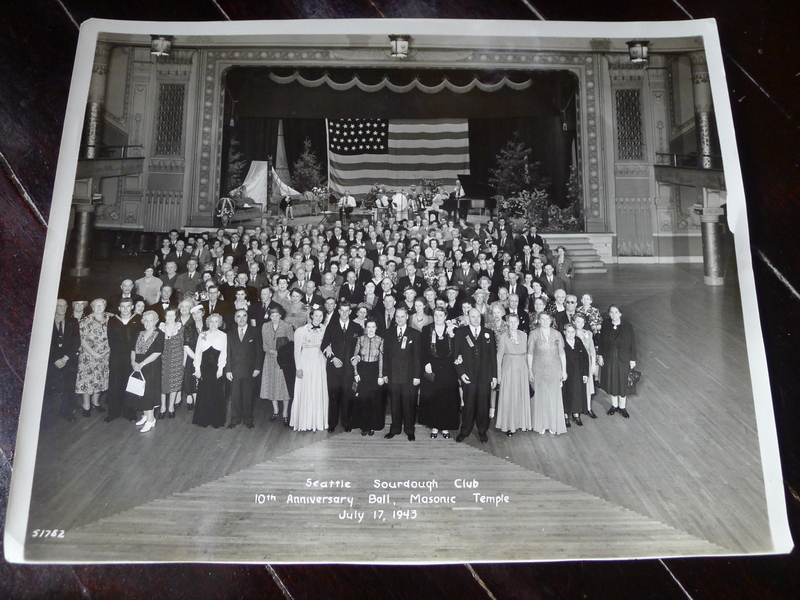 The last photo is this group shot of the “Seattle Sourdough Club” taken in 1943. I did a little research and couldn’t find any information as to what this Sourdough Club would have done. If anyone has any information let us know! My photo of the photo doesn’t really do its clarity justice, it’s really quite a cool piece. All that’s really left to sort through now is the massive haul of old, vintage clothes. I’ll show you some pictures at some point! That’s all for this week, though. I’m taking tonight off, I’ve biked a lot of heavy loads this week and feel I deserve a bit of extra rest. Thanks for sharing, it’s great to see the old things. Ebay is the place for lots of it included the knitting books. I giggled when I saw the DyDee thing.. imagine holding on to that item for almost 70 years? Why? Love the Auntie pic..beautiful condition too. Oh, and good news on the bakelite items. Maybe an antique dealer who deals in old jewelry and lady items might be interested in putting a necklace together with the beads? I love your blog.I hope somebody in Ottawa,Toronto and Vancouver respecively will take your inspiration and start a blog similar to yours based on the treasures they find while scavenging in their city. Do you check the recycling bins regularly in different neighborhoods?I get the impression you check garbage bags and plastic bags much more often.You find just as many treasures,if not more,in recycling bins than in garbage bags. Re: the Sourdough pic … the lady on the couch onstage left looks to have been decapitated … or at least (head in hands) she’s definitely not as happy as the rest of the folks in the pic. There’s a story there, I’m sure. 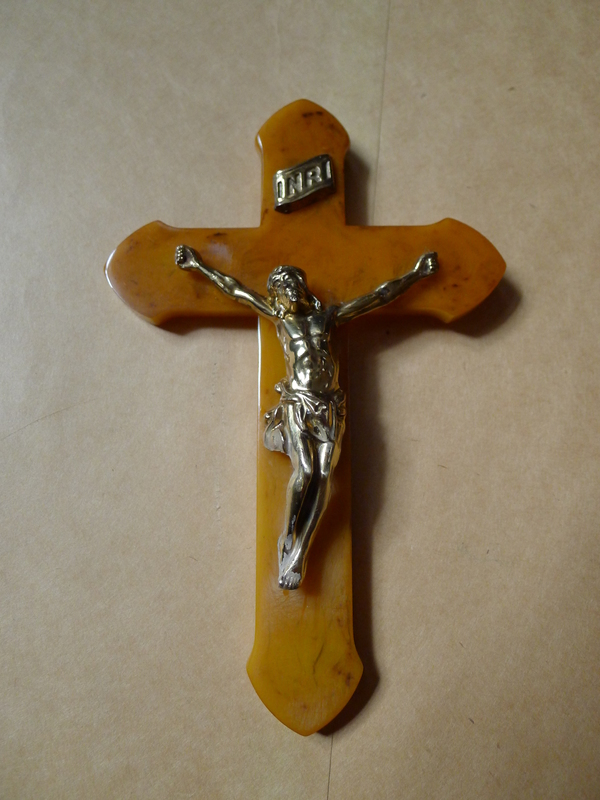 Is the Christ figure on that Bakelite cross made of silver? There are a few Bakelite crucifixes on this page http://www.etsy.com/search?includes%5B%5D=tags&q=bakelite+crucifix Average price = $35. I hadn’t noticed her! She definitely doesn’t look too happy. I don’t think the figure is silver. The Yukon Goldrush was in 1897 (well that’s when the gold was first found, it took a while for the news to get out), and that made Seattle a major point for getting up there. Seattle was relatively small, the gold rush helped to boost it. Swiftwater Bill Gates hailed from Seattle, somewhat on the wrong side of the law but not as bad as Soapy Smiths’ gang in Skagway Alaska. So my guess is that the SOurdough Club might be for people who’d gone to the goldrush. That’s a guess, but in 1943, there could still be lots of people who were young when the goldrush happened. The book I have about the early days of Seattle is well buried, but this sounds like something like that. I just today came across your blog and have become addicted to it. I can’t wait to see the vintage clothing you found. If they are nice I may like to buy some from you!